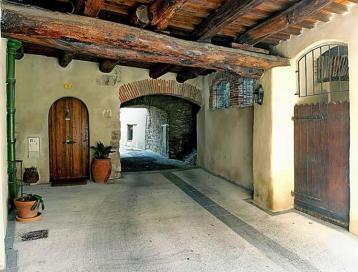 It is a wood covered passageway with very large, well-preserved beams. It was in the castle of Laroque that the first king of Majorca, Jacques 1st, took refuge in the castle when his brother Pierre III (King of Aragon) came with a bunch of knights to surprise him in order to stop him from ganging up against his brother. The Kingdom of Majorca is the land conquered by King Jacques I of Aragon in 1229 , during the Reconquista. It consists of all the Balearic Islands (Ibiza was conquered in 1235 and Minorca in 1287). The conquest of the Island of Majorca lasted from 1229 to 1231. In 1231, King Jacques entrusted the lordship of the island to his child cousin, Pierre of Portugal, then, in 1244, he exchanged it for the kingdom of Valencia, before again giving it back in 1254. On Pierre's death in 1256, the lordship was returned to the king. The 'kingdom of Majorca' means the political entity emanating from the 1262 will for the benefit of the second son of Jacques I, King Jacques II. As well as the Kingdom of Majorca, it includes the counties of Roussillon, Cerdagne and the dominion of Montpellier. Jacques II reigned from 1276 until the death of his father in 1281. Perpignan, where there is the castle called the Palace of the Kings of Majorca, was the capital of this kingdom. This kingdom of Majorca existed until its abolition by the Decrees of Nueva Planta in 1716.